The New York Radio Source - our studio facilities. The New York Radio Source is at the cutting edge of the latest technology and we spare no cost in bringing the best quality to our customers. Our studios and facilities are available for hire at decent rates, should you need to have your own reporter in a studio in the heart of Manhattan. We can link to your station by ISDN or phone. State-of-the-art technology - the heart of the New York Radio Source studio complex. Our ISDN is the CDQ Prima 120 (capable of connecting to all configurations from G722 to MPEGL2 and MPEGL3) via the Adtran ISU 2 x 64, and the Alpha Telecom Super NT-1. 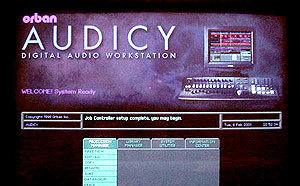 Digital editing and mixing is undertaken by the Audicy Digital Audio Workstation by Orban (see above), backed up by the Instant Replay and Shortcut Audio Editor by 360 Systems. All our sound is mixed through a Soundcraft RM105 Mixing Board. For CD Recordings we use the Marantz CDR 630. For Minidisc we have the Sony MDS-E12. 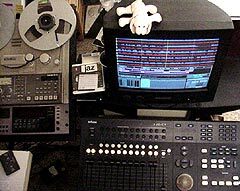 For cassette we use the Tascam 122 MK III and the Denon DN-790R. We also use a DAT Recorder/Player: the Sony PCM-R700. We even have a nostalgic Tascam BR-20 reel to reel machine for those of you who like some authentic tape hiss! !